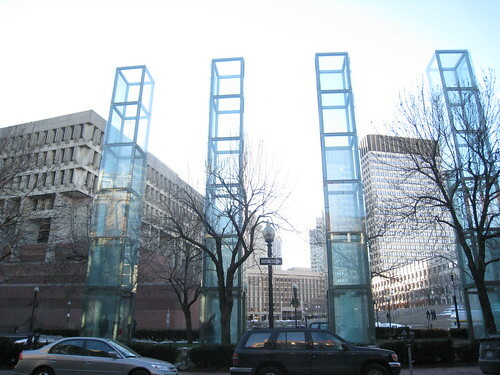 When George and I were in Boston we saw the New England Holocaust Memorial which is very breathtaking, but also very sad. These four columns, along with two not pictured, represent the six Nazi concentration camps (or the six candles in the menorah). At the bottom of each column, smoke rises from charred embers. Viewing the memorial, it's hard not to imagine the horror of the death camps and the unbelievable suffering that happened there. Today, the anniversary of the Auschwitz-Birkenau camp's liberation, has been designated a Holocaust Remembrance Day by the United Nations General Assembly.